Put the chocolate, the eggs, and the vanilla in a blender. Blend briefly to break down the chocolate. Heat the heavy cream and espresso powder in a small saucepan on the stove until it just comes to a boil While the blender is running, pour the hot cream in a steady stream into the hole in the top of the blender. The mixture will become thick and creamy. Let the blender run until everything is smooth. Pour the chocolate into small vessels and refrigerate for at least 2 hours, or longer if you like. 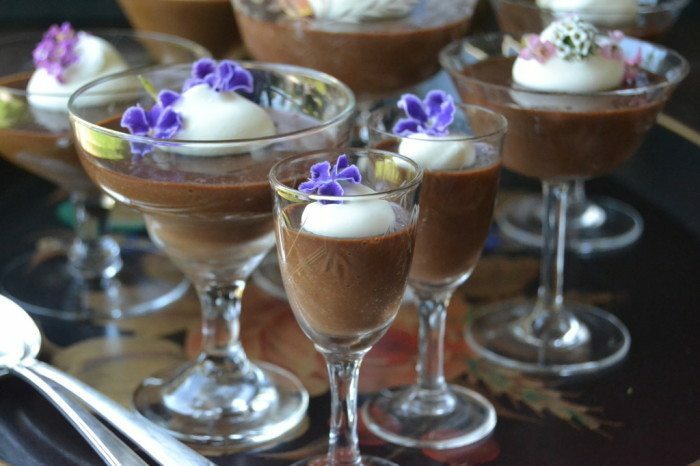 When ready to serve, whip the 1/4 cup cream and top each serving with a dollop and a few small colorful blossoms.